It can be a murky process for managers to delve into the performance of their corporate investments in environmental conservation and track their outcomes. Now, two tools, IRIS and iPAR, can work together to provide a visually attractive way to watch how these investments are performing. iPAR was released for public use on April 26. “We broke up the whole world of impact investment metrics and reporting into four themes: climate, people, public and resources,” Weatherley-White said. expressed throughout a sample portfolio of investments. Within the software, these themes look like colorful building blocks. These building blocks categorize 559 measurement metrics from IRIS. Investors can click on these blocks and navigate through pages that explain the performance of the investments. The subpages for the blocks show quantitative, detailed measurements of progress – including quarterly reports. Within the four quadrants in iPAR’s building-block graphic are sixteen subcategories. There is no clear dividing line separating conservation finance from other types of investments. These categories overlap. For example, one sample investment layout from an online demonstration showed that iPAR is tracking the number of species protected, the amount of revenue generated, the number of forest rangers who were hired to deter poaching, the number of people whose quality of life improved, and the number of carbon credits the project obtained. This forest-related investment is taking place in a developing nation. These metrics are developed based on groundwork laid by IRIS. IRIS is a well-established catalog of social and environmental performance metrics that is available online. It is managed by Global Impact Investing Network (GIIN). 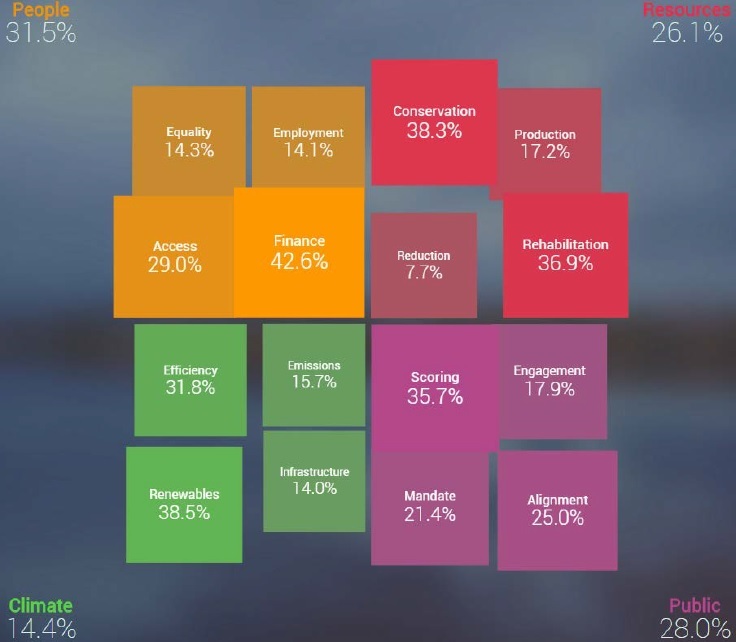 IRIS contains a variety of ways to measure conservation-related investments. Several working groups have developed these tools over the years. The catalog does not cover data collection. "While the scientific community has developed well-established and rigorous approaches to evaluating conservation methods, there are still no go-to impact metrics for land conservation investments at large," said Kelly McCarthy, senior manager of IRIS and impact measurement at GIIN. Weatherley-White developed the software with his team to make it easier for financing to “flow into the ecosystem.” He is an enthusiastic proponent of leveraging iPAR to solve thorny problems that socially conscious corporate investors face. These problems are multifaceted and difficult to resolve. Inconsistency bedevils organizations that are attempting to uphold reliable standards systems for corporate social responsibility. iPAR and IRIS attempt to build on established, existing standards to create a unified and relatively consistent vocabulary and measurement schema. “IRIS continues to strengthen the metrics catalog and fill gaps in the conservation finance sector by partnering with existing third party standards to bring the most relevant impact metrics into one place,” Mccarthy said. Note: This article has been corrected to state that iPAR uses 559 metrics, rather than over 600. It also was edited to indicate that IRIS includes a wide range of social and environmental performance metrics that go beyond corporate social responsibility.